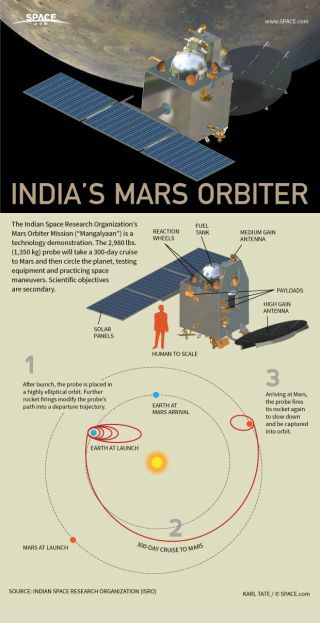 After a 300-day cruise through space, India's Mars probe will circle the planet. The Indian Space Research Organization’s Mars Orbiter Mission (“Mangalyaan”) is a technology demonstration. The 2,980-pound (1,350 kilograms) probe will take a 300-day cruise to Mars and then circle the planet, testing equipment and practicing space maneuvers. Scientific objectives are secondary. After launch, the probe is placed in a highly elliptical orbit around Earth. Further rocket firings modify the probe’s path into a departure trajectory. The cruise to Mars lasts 300 days. Arriving at Mars, the probe fires its rocket again to slow down and be captured into orbit. India’s Mars probe is expected to spend six to ten months in orbit, studying the Red Planet’s environment, snapping photos of its surface and searching for methane in the atmosphere, which might be an indicator of life.